Back in the hometown after a great four-day weekend in NOLA, land of great seafood (both boiled and fried), Abita beer (both draft and bottled), the original “snowball,” the Sazarac, and other tasty treats. I also saw 20 of my relatives and my parents, who were down at the same time from Cleveland. We ratted the streets in the 95-degree heat, ate too much, reveled in the city’s resilience, and appreciated air conditioning. But enough about me. Last week was a theme so this week is a non-theme. Just popular music singles from the beginning of the rock era (1955) through now. Dear God, the rock era is 55 years old. Hail, hail rock and roll. Good morning all! I’m reporting for duty from the Crescent City, the Big Easy, NOLA, New Orleans. I’ve never lived here, but it’s always been my home away from home. My Mom grew up here, my Dad an hour up the road, and the large majority of my extended family still calls it home. It’s such a unique and wonderful place; if you haven’t ever been here, you need to come. If you’ve been, come again. There are always new dishes to sample, new bookstores to visit. And did I mention the Super Bowl champions! Ahh, yes. The fearless Saints. As a bit of a tribute, all of today’s lyric-quiz artists share their name with a Saint – not a New Orleans Saint, mind you, but an actual canonized Christian saint. (How many singers are named “Reggie,” anyway?) Good luck, and let the good times roll. Oh, sure, you may fancy yourself a music snob, but everyone out there has uttered the following phrase at least once: “Huh? I didn’t realize this was a remake.” Whether it’s the Crüe’s take on “Smokin in the Boys Room” or The Bangles’ cover of “Hazy Shade of Winter,” there are those tunes that sneak into our collective memories with amazing potency, yet they are not the original performances. Here are 10 of those songs. Bonus for naming both artists (and by “Bonus,” I mean bragging rights to yourself and those in your immediate household). The decade in parentheses is when the SECOND (or the more popular) version hit the airwaves. So back in April, 2001 – good God, that’s nine years ago – I began a silly little game. Every Friday, I sent out snippets of song lyrics from 15 different songs. Just to my close friends. 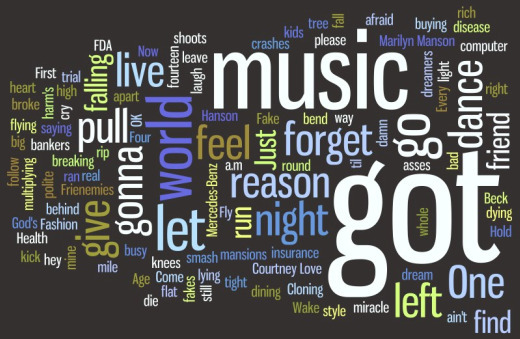 Just a “lyric quiz” of songs from the past 21 years (since 1980 … yes, that would now be the past 30 years, for those keeping score). The distro list grew. Friends of friends got added, as did strangers. I began posting the quizzes to my old blog, and traffic would spike (relatively speaking, of course) on Fridays. I started adding themes (“Songs with Girls’ Names,” “Bands With Bald Singers,” “Songs with Animals in the Title”). And then! BAM! Book deal. Revenue-banking web site. A spot on VH1 I Mother-F*cking HEART the 90s! Well, so none of that last part is true, as it turns out. In actuality, I was faithful and loyal to the project for eight years and quit, quite unceremoniously, last March. I felt out of touch with the music of today (as I’ve noted here previously), I was slammed at work, no one was “playing along” with the quizzes anymore, and it had become more of a burden than a hobby.